NHL News : Matthews will be the NHL’s first $16-million man! Matthews will be the NHL’s first $16-million man! This strategy for a new deal is so good, it is scary! There might be one major contract dispute getting all the attention in Toronto, as the Maple Leafs and free agent forward William Nylander are still trying to agree on a new deal, star forward Auston Matthews said at the start of the season that he does not want to be distracted by his own contract status. Matthew is set to become a restricted free agent in the summer of 2019 and many NHL insiders out there believe he will be awarded one of the biggest and most lucrative contracts in the league. And the kid is surely making a case for it: in nine games already this season, the Maple Leafs young star has tallied 10 goals and 16 points. While he might not end up collecting a total of 100 goals this season, he may collect big money wise. 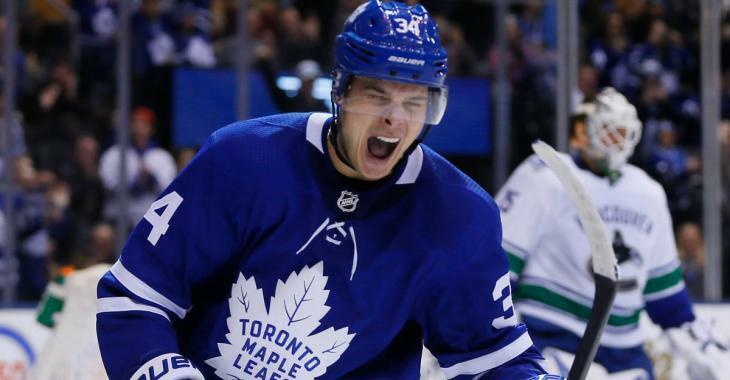 “Auston Matthews, in my opinion, will be the first $16 million man in NHL history,” bluntly said NHL insider Ken Campbell on the latest Hockey News podcast on Monday. “I will tell you why. This year, the cap is set at $79.5 million, that makes 20 percent of the cap 15.9. If we go with the assumption that the cap is going to go up a little over 80, 20 percent is $16 million. Why would you right now, if you were Auston Matthews, settle for anything less than $16 million? Because unlike any other player out there, you know there will be an offer sheet for $16 million out there if the Leafs don’t sign you for that. Who better to offer sheet Auston Matthews for $16 million than the Arizona Coyotes. Wow. That would be quite a way to pull at Matthews’ heart strings for the Coyotes, the team he rooted since he grew up in Arizona. Campbell sure threw quite the curveball here and the Coyotes might be on the lookout now, even more than before, on what is happening with the Matthews contract talks in Toronto. Especially that we all know how quickly things can change. This strategy for a new deal is so good, it is scary! Let’s see if Matthews will need to orchestrate it to get what he wants with the Leafs.